How does one explain the divisive political flurry that is Brexit? 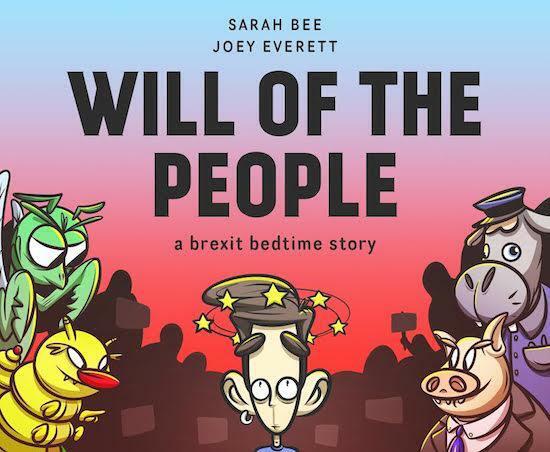 Writer Sarah Bee is to taking a crack at it with a comical picture book called Will Of The People. In her own words, "it's the satire the country deserves and is going to get whether it likes it or not", referring to Brexit as a "terrifically immature moment in our nature's history". Receiving support from the likes of Ian Dunt, AC Grayling and Alastair Campbell, the humorous tale promises to entertain. In order to aid the release of the book, Bee launched a 30-day crowdfunding campaign, which has already hit its initial goal. Backers will receive both hardback and digital copies of the book, tote bags and limited edition prints illustrated by Joey Everett. Tickets for a Thames-docked boat launch party will also be included with the book set for release via RedDoor Publishing on Article 50 Day - March 29, 2018 to be exact. Contribute to the crowdfunding campaign and find out more here. Sarah Bee recently contributed to The Quietus - read her piece on why adults need picture books in 2017, and why the dismissive need to put a dummy in it, here.